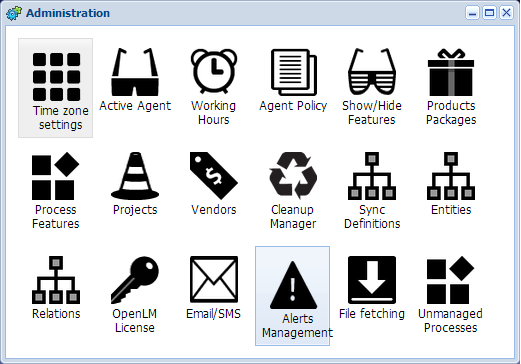 The OpenLM Alerts module is designed to ensure the stability and availability of the organizations licensing system. It enables system managers to define alert conditions, and consequent actions that will be taken when these conditions are met. The system can handle complex conditions over multiple license servers and features. 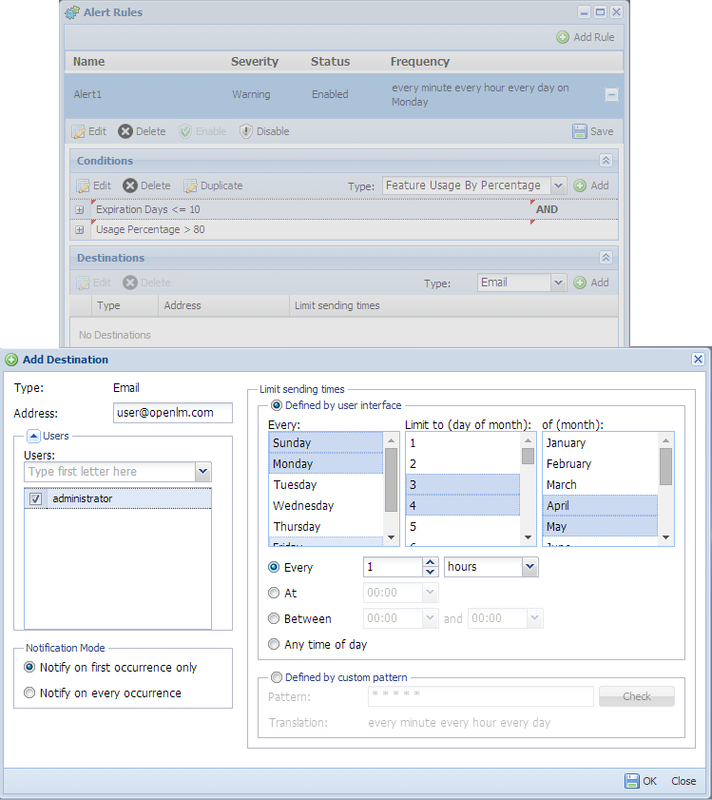 When a condition is met, the system could present alert messages on the EasyAdmin ‘Alerts’ window, on in log file or send alert messages to predefined email or SMS accounts. This document presents the OpenLM Alerts’ functionality and configuration options. 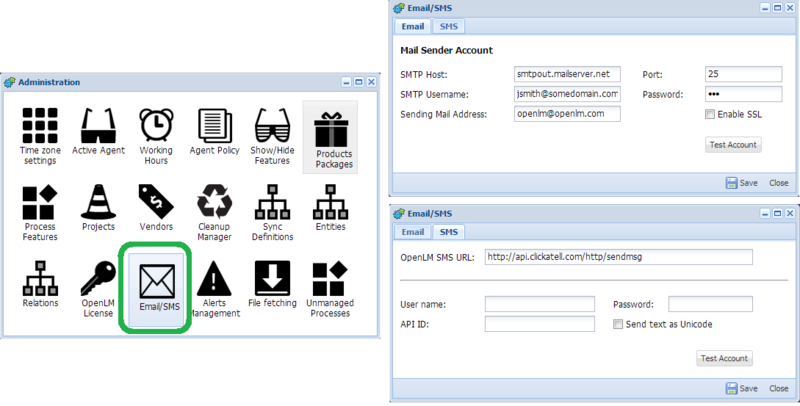 Open the OpenLM EasyAdmin web application, click the ‘Start’ button and select ‘Administration’. The ‘Administration’ window opens. Click the “Add Rule” icon to introduce a new Alert condition. The “Add alert rule” window opens. Name the new alert (e.g. : Alert1), and set its severity level annotation (e.g. : Warning). Select the timing and frequency of the Alert sample. This is the timing in which the system checks whether the Alert condition has been met. 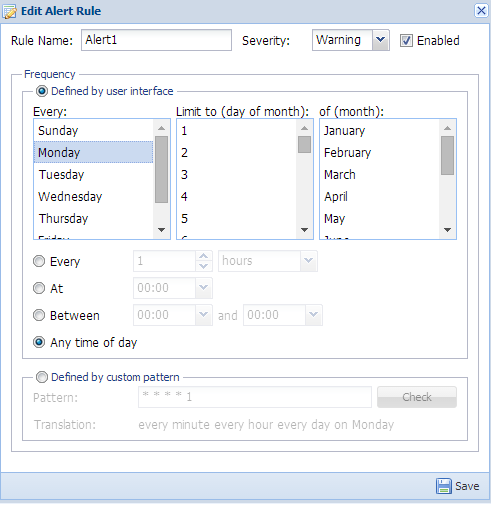 There are 2 methods for setting the sample timing: via the user interface (as depicted above, every minute on Mondays), or by a custom pattern – which is translated for convenience below the pattern definition. Click the ‘Save’ button. The “Alert Rules” window opens. Click the ‘Type’ dropdown menu, and select alert type. Feature usage by percentage: Notify when feature usage is above or below predefined thresholds. Duplicate license usage: Checks whether a user draws the same licensed features on multiple workstations. Feature Expiration date: Alert that a feature license expiration date is coming up. License server not responding: OpenLM fails to connect to a monitored license manager. Users not assigned to a default group: Their license usage will not be attributed to any group but the default “OpenLM _Everyone”. Users not assigned to a default project: Their license usage will not be attributed to any project. Usage session duration: Notify that a license has been checked out for more than a predefined period. Total number of : Notify that the number of license denials has surpassed a predefined threshold during a predefined period. Alert configuration windows are straightforward. They slightly differ in their configuration; some require a threshold number or period to be typed in, but the general idea behind each type’s configuration window is quite similar. See an example of the Feature Expiration alert below; The user needs to select a feature, and type in a threshold. In this example, when the number of days to expiration is smaller or equal to 10 – the alert will become active. After configuration – click the ‘Save’ button. Additional alert conditions may be added on the alert form, and AND / OR logic may be applied between these conditions. The AND / OR logic is applied serially (without parenthesis). See the image below of two separate conditions (expiration <= 10 AND Usage percentage > 80). Set the alert destination: Click the dropdown menu and select either one of the methods: Email / SMS / EasyAdmin / Log, and click the ‘Add’ button. Note that multiple destinations may be selected. There is a method for setting up the Alerts’ timing (e.g. : If the system administrator is reluctant to receive SMS messages at 3:00 AM). 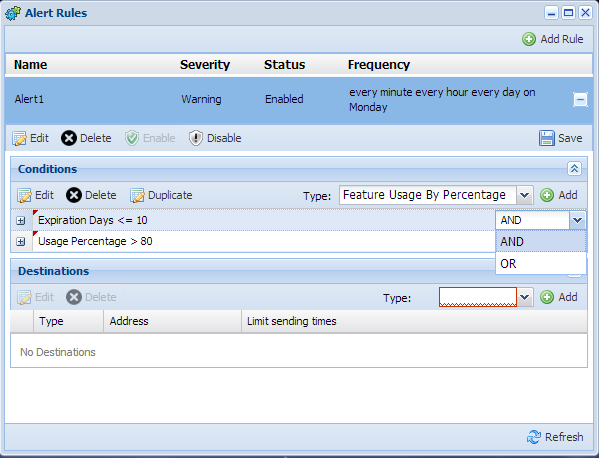 The “Limit sending times” interface takes care of the sending time. With a UI similar to the “Alert rule” timing above, “Limit sending times” integrates a set of limitations to the Alert sending time. 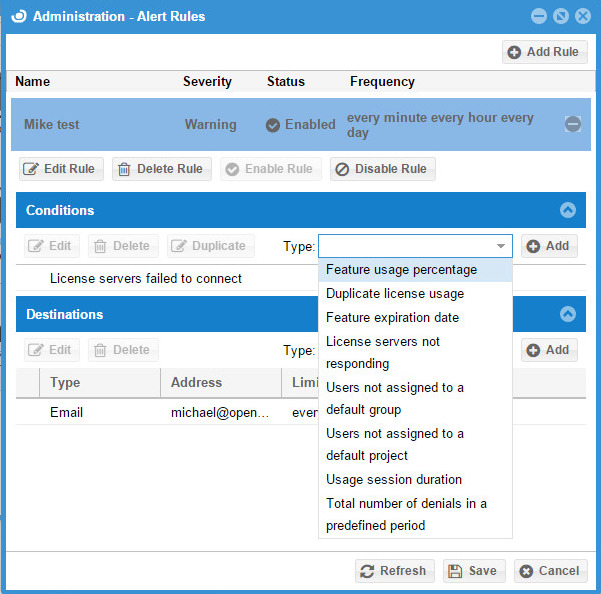 The user can also select whether to send an alert on each Alert condition match, or to suppress additional alert notifications after the 1st occurrence. Every Alert query consumes resources from the OpenLM system, hence a good alerts’ system should contain the minimum number of checks that would assure a stable and effective licensing system. 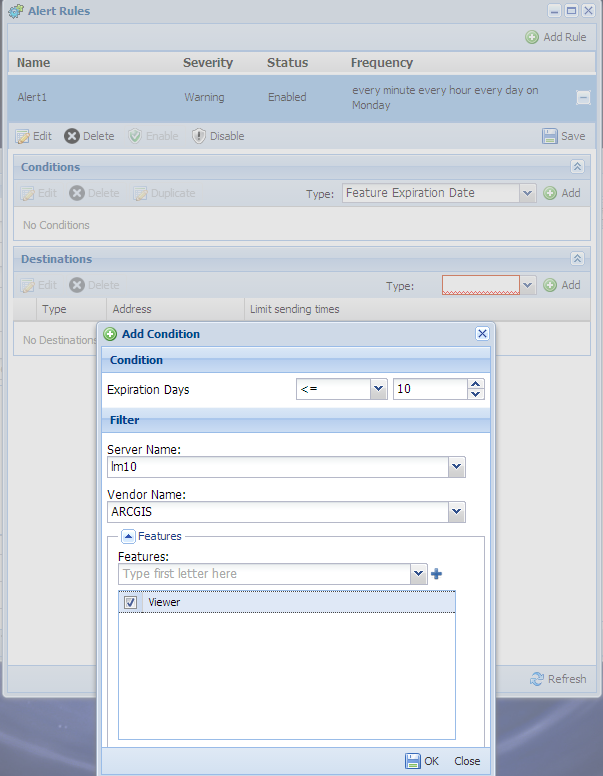 The Alerts’ destination editor” window enables the direction of alerts to desired destination. For example, an alert may be sent to an email during work hours and to SMS after work hours.